The gifs shown here were first published as part of an essay on the web authoring and publishing platform NewHive in which he presented them as part of a step-by-step tutorial with the title "How to Make an Expression." The title played on the incongruity between the ideal of free creative expression and the seeming rigidity of a howto; Ciocci described the NewHive project to art blog Hyperallergic as an attempt to create his own artistic rules that mirrored the (often unacknowledged) rules that are applied to creativity by, on the one hand, online platforms like NewHive, and on the other, by craft stores like Michael's or JoAnn's. 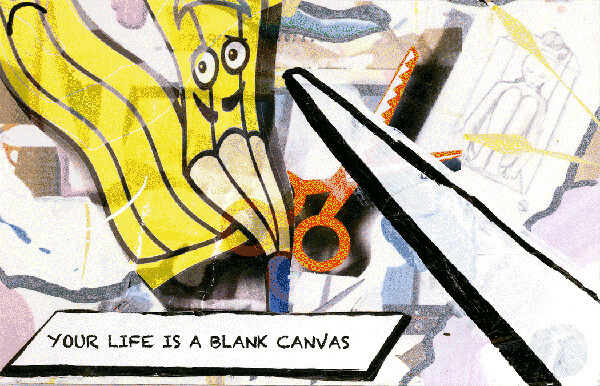 Ciocci has an ambivalent relationship with such rules, at once acknowledging how much he appreciates the freedom they offer while urging himself in his own practice to "think outside the box," a personal mantra he has embraced since his days as a member of the influential Paper Rad collective in the mid-2000s. A solo show of Ciocci's work on view in Brooklyn, New York at Interstate Projects through October 25; read Nicholas O'Brien's review for Rhizome here. For more on Ciocci's work, see his Artist Profile. For more on his work as part of the band Extreme Animals, see Brian Droitcour's review of their 2014 DVD release. Paper Rad's work extremeanimalz, which is about "animals going nuts," can be found in the Rhizome Artbase. An archive of Paper Rad's website as of 2008 can also be found in the Artbase. I like the colors. Yes I know I sound like Chanuncey Gardner a bit but that's the truth. I personally FEEL art has become over-intellectualized to death and I'd like to see a return to the focus on the marks themselves and how a work makes one FEEL - sentiment, passion . . . meaning, paradox . . . the mystery of that and the visual language that helps one know one artist as distinct from another over yes a lifetime of changing work . . . and of course marks that speak to this time as distinct, like um digital. So much to discuss . . . although I think I'm having a dialogue with myself but well, OK.